Media is a region of north-western Iran, best known for having been the political and cultural base of the Medes. During the Achaemenid period, it comprised present-day Azarbaijan, Iranian Kurdistan and western Tabaristan. As a satrapy under Achaemenid rule, it would eventually encompass a wider region, stretching to southern Dagestan in the north. However, after the wars of Alexander the Great, the northern parts were separated due to the Partition of Babylon and became known as Atropatene, while the remaining region became known as Lesser Media. Cappadocia was a satrapy (province) of the Achaemenid Empire used by the Achaemenids to administer the regions beyond the Taurus Mountains and the Euphrates river. The Satrapy of Lydia, known as Sparda in Old Persian, was an administrative province (satrapy) of the Achaemenid Empire, located in the ancient kingdom of Lydia, with Sardis as its capital. Cilicia was a satrapy of the Achaemenid Empire, with its capital being Tarsus. It was conquered sometime in the 540's BC by Cyrus the Great. Cilicia was a vassal, and although it had a vassal king it had to pay a tribute of 360 horses and 500 talents of silver, according to Herodotus. The fertile Cilician plains were the most important part of the satrapy. Mazaeus, Mazday or Mazaios (Greek:Μαζαῖος) was a Persian noble and satrap of Cilicia and later satrap of Babylon for the Achaemenid Empire, a satrapy which he retained under Alexander the Great. Athura, also called Assyria, was a geographical area within the Achaemenid Empire in Upper Mesopotamia from 539 to 330 BC as a military protectorate state. Although sometimes regarded as a satrapy, Achaemenid royal inscriptions list it as a dahyu, a concept generally interpreted as meaning either a group of people or both a country and its people, without any administrative implication. Orontes I or Yervand I was an Armenian ruler of the Orontid Dynasty who ruled as satrap of the Achaemenid Empire between 401 BC – 344 BC. The Persian version of the name is Auruand which meant "Great Warrior" in the Avestan language. It is likely this was a special title given by the Persian king, though this seems to have become a hereditary title in that family. The Achaemenid conquest of the Indus Valley refers to the Achaemenid military conquest and occupation for about two centuries of territories of the North-western regions of the Indian subcontinent. The conquest of the areas as far as the Indus river is often dated to the time of Cyrus the Great, in the period between 550-539 BCE. The first secure epigraphic evidence, given by the Behistun Inscription inscription, gives a date before or about 518 BCE. Achaemenid penetration into the area of the Indian subcontinent occurred in stages, starting from northern parts of the River Indus and moving southward. These areas of the Indus valley became formal Achaemenid satrapies as mentioned in several Achaemenid inscriptions. The Achaemenid occupation of the Indus Valley ended with the Indian campaign of Alexander the Great circa 323 BCE. The Achaemenid occupation, although less successful than that of the later Greeks, Sakas or Kushans, had the effect of acquainting India to the outer world. Hellespontine Phrygia or Lesser Phrygia was a Persian satrapy (province) in northwestern Anatolia, directly southeast of the Hellespont. 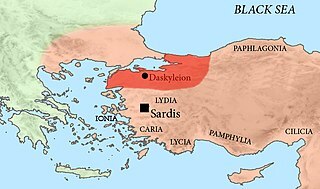 Its capital was Dascylium, and for most of its existence it was ruled by the hereditary Persian Pharnacid dynasty. Together with Greater Phrygia, it made up the administrative provinces of the wider Phrygia region. Gandāra, or Gadāra in Achaemenid inscriptions was one of the easternmost provinces of the Achaemenid Empire in South Asia, following the Achaemenid invasion of the Indus Valley. It appears in various Achaemenid inscriptions such as the Behistun Inscription, or the DNa inscription of Darius the Great. Amminapes was a Parthian who was appointed satrap of the Parthians and Hyrcanii by Alexander the Great in 330 BCE.